Priyanka asks Shivay about his move to badly treat Anika and throwing her out of the house. He reminds her what he means to her. He ends the discussion and asks Priyanka never to get Anika home. Omkara feels the reason is something big, else Shivay would have not reacted this way. They decide to find out the matter. Daksh thinks whatever he has done can’t change now, and Anika will never come back in their lives. He gets happy to win. Anika’s aunt gets angry on losing the shelter once again. She asks Anika what wrong did she do that Shivay has kicked her out. Anika hides the matter from the family and promises to manage the expenses. Gauri asks Anika about the problem. Anika doesn’t feel like answering Gauri. She hides her sorrow and tears. She doesn’t know why Shivay made her out. Shivay tells his brothers that they have to manage all the pre-wedding functions on their own. Omkara asks Shivay the reason for ousting Anika. Shivay doesn’t reveal anything to them. 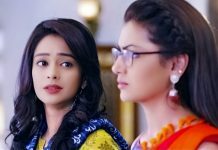 Anika recollects Shivay’s words to get clue of the misunderstanding. She doesn’t understand why Shivay got so angry and didn’t even give her a chance to clarify. She decides to caution Priyanka by revealing Daksh’s truth to her. Priyanka gets busy in selecting her outfit and takes help from Tia. Shivay doesn’t let Anika reach Priyanka. He answers Anika’s call and takes the phone with him. Anika understands that it isn’t easy to talk to Priyanka. She seeks help from Khanna and goes to meet Priyanka. She misses to meet Priyanka. Shivay gets emotional on seeing Priyanka. He sheds tears thinking of her bidaai. Obros dance with Daksh and celebrate happiness. Anika manages to enter Priyanka’s room and writes a note for Priyanka. She reveals Daksh’s truth in the letter and hopes she reads it in time. Shivay catches Anika in Priyanka’s room. He warns her against becoming the enemy of Priyanka’s happiness. He asks Anika why did she use the video against him and his family reputation. He confronts her for stooping to low level and using them for money. He tells her that he has seen her truth and hates her for it. Anika tells him that he is wrong about her. He calls her upbringing wrong. She gets hurt listening to his bitter words. She asks him not to judge her by listening to anyone else. He doesn’t give her a chance to explain. 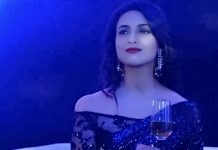 Anika meets Khanna to know about Priyanka. He tells her about Priyanka’s mehendi function lined up. She realizes Priyanka didn’t get her letter. She meets Payal to help out Priyanka and stop the wrong marriage. Payal doesn’t listen to Anika. Anika gets a solid proof at Payal’s house. She follows the link and finds out Payal’s pregnancy reports. She finds this a big evidence against Daksh. She meets Payal once again and tries to convince her to expose Daksh. Payal admits about her affair with Daksh. She tells Anika that Daksh started avoiding her now. Anika sympathizes with her and asks Payal to marry Daksh to give a name to the child. She begs her to save Priyanka’s life. Anika succeeds in convincing Payal, while Daksh overhears their conversation and plans an attack on Payal.